Gibson Brands has announced plans to acquire Boston-based music software company Cakewalk - which is best known for its Sonar DAW and the Z3TA+ synth - from current owner Roland. Although the Cakewalk team will continue to operate in Boston as an independent entity, the move will result in the creation of a new brand, TASCAM Professional Software, which will be responsible for all of Cakewalk's current and future products. 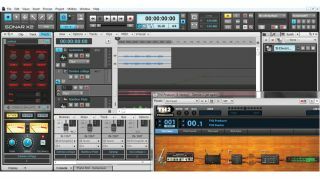 TASCAM Professional Software will join Gibson's Pro Audio Group, which was created in 2011 when the company bought the Stanton Group of brands, including Stanton DJ and KRK Systems. Gibson CEO Henry Juszkiewicz said of the move: "If imitation is the sincerest form of flattery, Cakewalk must be very flattered that so many of their innovations have become industry standards. As an addition to the Gibson Pro Audio Group, Cakewalk will enhance their flagship professional products, pursue provocative R&D initiatives, and continue to serve the needs of musicians and producers world-wide." Reaction from music makers online has been less enthusiastic, however. Commenters on both Create Digital Music and Synthtopia have repeatedly raised concerns relating to the fates of tech brands Oberheim and Opcode, both of which were acquired by Gibson in the '90s, along with those of various guitar and bass manufacturers the company has bought over the years. Furthermore, the results of some of Gibson's own R&D moves in recent years, such as the Firebird X digital guitar, have received fairly mixed critical responses. To respond to some of these possible concerns, Cakewalk has posted an FAQ on its site. What do you make of the acquisition? Are you ready to accept TASCAM Sonar?